Growing Up With Music …………………………………………………………. Music in Austin: A Turning Wheel ………………………………………………. An amusing, charming character, Matthew’s delivery combines a powerful, outstanding voice with an impressive guitar style. Modest, but uniquely deep, Matthew has that magical touch that thrills you more the more you listen. His driving guitar sound is raw and classy, and is often spiced up with jazz. Overall, it’s purely Texas style, Blues that wasn’t learnt at schools but through life experience. Over his more than 40 year professional experience, Matthew has basically played in every venue in Austin. Furthermore, during the late sixties, he successfully toured the United States as the singer of The Mustangs, opening up for Jimmy Reed, James Brown, Big Mama Thornton and Johnny Winter, and over the years he has also performed in countries like Holland, Brazil and Japan. 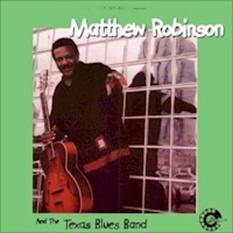 Matthew Robinson truly represents the Bluesman figure and Blues people, as he unconsciously keeps remarking, are story tellers. They talk about life stories; good or bad, happy or sad. But still about this uncertain thing we call “truth”. 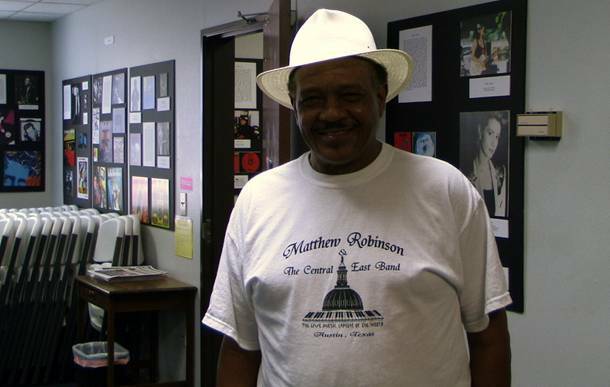 Personally, the one tune that struck me most was “Cross Your Heart”, a song that Matthew picked up after listening to Sonny Boy Williamson II on the radio. Those lyrics: “When you cross your heart to someone / you’re not supposed to tell a lie…” pronounced in Matthew’s distinctive vocality just felt like the everlasting feeling of a convincing down home blues. I tried to find my picture here [Matthew points at the wall in the Texas Music Museum] when I had my first professional band, called the Mustangs. We took our picture right there by those Mustangs at the University Campus. You know those white mustangs? That’s where we took our picture at. I can’t find it. I guess you can go to the library and find it but … [laughs] People come by and visit and they take pictures and will have to bring them back or whatever. But the picture is gone. It’s the way it goes. I was born and raised in Austin. I was born in Hospital (...) but we lived in a place called St. John College Heights and it’s still there. Off of 35, St. John is a neighborhood over there. People wouldn’t recognize it now ‘cause it was just open spaces and now is all kind of homes and stuff over there. But that’s when I was born, 1948 (…) Hospital, Austin, Texas. I left St. John going into the third grade. That’s when we moved to town and from the third grade on we’ve been stand there. Austin is just spreading. It’s always been a nice place for me. I like going everywhere but when you wanna rest you wanna come home. Probably around age of 3 because my parents. My mother, she sang gospel and daddy; he was the youngest of the seven brothers which were all preachers except for him. He was always playing guitar and music and stuff like that. So, on the church with everybody singing and you didn’t realize at three that you were really being trained. I guess I have to say I can remember at three but I probably start before that. There’s a picture [of me] right up here at the age of six or eight months playing an old piano and I didn’t even know. But I was aware at three. Not that I was going to be a musician or anything but the joy and power of music, storytelling and songs. How powerful that was. What was the influence of the church in Black music? Mostly everybody I knew, and almost everybody that I didn’t knew but liked the music probably started in church. You know, when you’re little you have to go to church and so, that’s probably where it started at. At home you could listen to other kind of music but mother is saying gospel and she wouldn’t let us listen to Blues. But I did get to watch TV and I notice Roy Rogers and Dale Evans. They had some nice harmony and good players playing, and that was really nice to listen for me. The cartoons had all this incredible jazz music; I didn’t know it at the time. [There were] little sound effects and really complicated rhythms behind these cartoons. You can picture in your mind the Pink Panther; you know how that goes, and the Flintstones. If you ever really listen to that music you can say: “I wonder why I enjoyed the cartoons so much”. The music was smokin’. I guess everybody can learn something from music. Music can get you there. Coming from a Gospel family, how was Blues perceived? Actually, being from a Black Baptist church most of my relatives is preachers and singers and stuff like that. We weren’t allowed to sing Blues or nothing like that so it was a long time before I even realized I liked Blues. The prejudice of it, I was still at a young age through my mother who wouldn’t let us do that. It was for a while I would even have a nurse say: “I ain’t gonna play no damn Blues.” But I just didn’t know any better and realized later on that I really loved it. If I had got there a little sooner that I did, I would probably be better now. It was a long rope but I finally got there and I’m happy that I did. Blues is also sometimes considered to be a sad genre. Oh yeah, but you can write Blues about being so happy that you don’t know what to do. And of course, there are the stories of sad Blues because Blues, most of the musicians are writing about their lives and in life you have ups and downs and all of that. You relate that through music. People can realize you’re telling the truth. If you’re not telling the truth people can recognize that, especially if they’re not musicians ‘cause they just gonna say “that sound good” or “that don’t sound good”. There’s no “oh, almost sounds good”. It either sounds good or it don’t. So you can thank the Blues… say “hey, I don’t sound good Blues”. Maybe you can make a hit. Did you have any particular influence by that time? It’s so strange because I liked everyone. 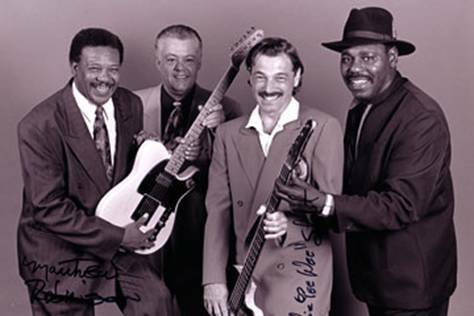 I mentioned Roy Rogers and Dale Evans, Andres Segovia, John McLaughlin, BB King, Freddie king, Albert King, Albert Collins, T-Bone Walker… I mean, it didn’t have to be Blues for me to like it, and it didn’t have to be guitar but I always liked to watch. For some reason, I can learn lines on the guitar being played on other instruments. It’s just complicated to me to play guitar written music. If I hear the same lick on horn or piano it makes it easier for me to do. I don’t know what that is but it’s the way I do. Which were the instruments you first learnt how to play? How did you actually learn? In my first professional group entitled The Mustangs I was just singing. I didn’t know how to read or nothing like that. We were together about six years and after that I started teaching myself how to play guitar but I tried all kind of instruments first. The guitar was the last one because I kind of thought you had to be like maybe a magic person to play guitar. I don’t know why, I always had this in my mind. Daddy played guitar and I said I probably wouldn’t ever be able to do that. I tried drums and I liked it but it wasn’t enough. Piano, at the time it was like these [points at the old piano in the room]; you can’t carry it wherever you go. Now they have these little computerized casios or whatever and you can take them anywhere. Then I tried to blow a sax but it hurt your lips. Anyway, one day I just decided I was going to play the guitar so I went down 6th Street and bought a small flamingo type guitar. I didn’t even know you were supposed to tune it by turning the machine heads which I didn’t know that’s what they was called then. I was learning songs and someone come and turn the machine head and be on another, you know, frequency. I just learnt the same song in there so that’s how I got my weird sense of chords. I got books, watched TV, watched other people, listened, videos… Whatever I could get, whoever I could ask be famous or not. I always wanted to know. I took a long time for me because I did everything backwards and it’s the hardest way to do it. I don’t know how I made it through that but I just kept on doing it. I just wasn’t aware of people… you know, when you first start learning something it can be annoying to other people maybe because you don’t really have it. I just kind of shift the world out and my mind and didn’t really care if someone said: “Man, you ought to put that down and get a job or something.” I always knew it was going to stay on me. I would talk to different musicians, not only guitar players but horn players, keyboarders…, ask them questions and watch it. I used to think B.B. King and all those guys when they were making all these faces playing guitar that they were just pulling the string. I realize now that they’re doing that ‘cause you’re trying to barely touch it and get the feeling to the exact frequency. And you’re pulling a string maybe. It’s just trying to make a guitar make what you’re thinking which is real complicated but it’s fun and easy if you let it be. That’s how I started and still learning to this day. I’ll always be learning if you stick with it because it’s like an endless thing. It’s a lifetime thing. Playing guitar, being a musician or whatever like that is your life so you have to live your life the best you can. There are many famous Texan musicians who are often not thought as Texan, in many cases because they moved up north. How was the atmosphere down here? Well, I don’t really think it was the atmosphere so much as it was the pay. If you wanna do it and you wanna do it for living you have to get paid. I know that just sounds like: “Oh, you’re so selfish…” and all that but it’s like any other job. You’re working because you wanna get paid and you need to get paid ‘cause you’re hungry, you need some clothes, some equipment, a car, or whatever. That’s mostly it, and the same thing in the church and gospel music. Nowadays I think you can get paid playing in church but back when I was coming up you didn’t get paid for playing in church. It was like you just did that for the talent of it, for God and Jesus which is ok. But if you notice, a lot of the famous people who used to be in church went to R&B, Blues and Jazz because they could get paid. Often times they will always come back and perform at the church because just because you’re playing some Blues and Jazz and all this it doesn’t mean you’re not religious. You can be playing some low down Blues and still be religious. That’s the biggest thing that I realize that draws people away. If you get an opportunity to do something over here and make some money of it, you’ll do that. I think it’s like that everywhere. So if you’re in New York but you have an opportunity in Austin, you’re gonna take that. I think that’s what it is, the opportunity to get paid ‘cause if you’re growing and getting better, to me that’s getting paid too. So it’s not just completely the dollar but it has a lot to do. How do you remember racial segregation? To me, when integration came, I was kind of already prepared for it because when we were small coming up in the country and picking cotton which I call the tail end of the cotton picking days, there were all kind of people picking cotton. You know, Mexicans, Germans, Swedish, whites… So we were always kind of used to being around other type of people and learning a little of the culture. Not the language but just a little bit of it or something. So when it really happened, we were already kind of prepared for that. Actually, when we moved to town that’s when I really discovered the prejudice. You go downtown and they had two water fountains. One says white and one said color. So color people had to drink out of that one but it was so funny mother would never let us drink out of it. She would let us drink out of the other one. I would talk to some of those little kids, you know how kids are, you’re curious, you don’t know. The black people wanted to drink because they thought the white water tasted different and the white people wanted to drink out of the color fountain because it was the right height. You have to learn that. That’s what had happened. And then, once people get to know that just because you’re from a different race or have a different culture or religion you still can come together in the joy of life together. Often times, that’s missed and that’s why I think a lot of times a lot of the stuff that’s happening today is because of that. You know, just prejudice. The more we get together, the better it’s gonna be. That’s me personally speaking, I don’t know if everybody thinks like that or not but that’s the way I think. “To be really there was something very special and just magical within itself. Tell me about the Black music tradition in East Austin. There’s always been a nice, hip music scene here in Austin and especially with the Blues but all kind of music too. They had a lot of places. Thinkin’ about it now, probably it will never end, it will always sum. Things change and go on, and some of the clubs have failed out by the wave side: Charlie’s Playhouse and Chicken Shack…. a lot of places, so many clubs that we played in. We played at fraternities and sororities and all this. It was always somewhere to play like it is now but it has changed. I like to look at it like the Blues never left. Some people say: “Man, the Blues is coming back!” But I didn’t see it going anywhere, it was here to stay. I think the young kids coming up learning to play, liking and playing Blues, and even though they might finish off into something else later the Blues has a big part to do with it. The notes are the same notes in any kind of music. You can call it whatever but the notes are the same. It’s just the feeling you can convey on your particular instrument that makes the difference. Some people are super good at it and some are ok, like myself, I am ok [laughs]. But I always try to keep growing. Tell me about your experience with all the musicians you played with. There’s so many musicians… and plus, I not only played with some of them, I would go and watch them and stuff. In here [Matthew refers to the Texas Music Museum], a lot of this musicians up in the wall I played with or at least went to see their shows or something but a lot of them I played with their bands or jammed with. There’s so many musicians, male and female, all kind of instruments that I met over the years through music. It’s fantastic. Now, at this age and time I realize what kind of opportunity that was to meet all of these people. Great, and some great but hadn’t been noticed yet and famous people too. I would just go up and maybe ask a question or something and they never denied me. In the beginning it was puzzling but it just made me want to get more and more knowledge. The harder it got, the more I needed. The more I needed, the harder it got. Sounds like a song I can write, maybe. I believe you also played with James Polk & the Brothers. 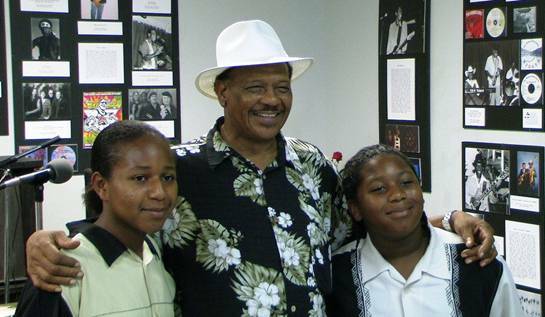 Yes, I played with James Polk & the Brothers and it was a really amazing experience. A lot of people in that band has gone into greatness like Martin Banks, who’s gone now, but he was famous for a long time. He was a trumpet player. And James Polk himself, now who’s Doctor Polk. That was a really good time for me and they helped me a lot not only in music itself but in disciplinary part because with that many people you have to have some kind of structure, I guess, or it will just be all over the place. I thought we did really good and I was really proud of being part of that. Today Antone’s is probably still the main venue associated with Blues in Austin. Yeah, it’s one of the best places that’s really gone with the Blues and Antone himself was a kind person. Even after his death, he’s still helping kids and people just by having the establish[ment] and remembering him. He did really care about the Blues people and he really loved the Blues. He was kind enough to give you anything you had, especially if you were a Blues musician, he would go all over the way with you. Some of those ventures where done at the Vulcan Gas Company which was on Congress and later on it moved and changed to Armadillo World Headquarters. That’s where I met a lot of famous people and great musicians. I don’t think people really realize what a loss it would be not to have those places but now that they’re gone, you can realize how it’s missed. If you have never got in to see that scene or be involved in it you just wouldn’t know, but you will always hear people talking about it or whatever, reading about it or something. To be really there was something very special and just magical within itself. I was just like the band’s name; a wild mustang not even realizing it. It’s all part of growing up being a musician. But those places really helped me meet a lot of people that was famous. It was a pleasure for me. Big Mama Thornton, Jimmy Reed and all those guys. Roky Erickson, The 13th Floor Elevators, and Johnny Winters… Oh man, the list just goes on and on. I was fortunate enough to play in a band. We played R&B but we had friends that played rock music and it was just that time to get together like that. It was just really nice. We had people just made us equipments. “You’ll sound so good, you don’t need that little bug” and they would make the equipment for us for free. I mean really expensive stuff that sounded really good. Because not only the talent that we had because we were opened up to all these tags of musicians… That was great for me and for those guys too. There’s so many I can’t even remember all of them. There’s so many I get dizzy trying to remember it. What have been the main changes in the musical scene since you started playing? The scene has changed quite a bit because different types of music has changed. As far as being a musician, everything went up except the musician pay. It went down. So, that’s the first thing. But if you love it you still manage to figure out a way how to stay afloat. Just the fact that the youngsters coming up with their version of it has made it change. For the most part, I think that’s very good. Like me, I like rap music and all of that too. I just can’t rap but I wish I could, if I could I’ll be doing it. I would like to but I enjoy watching the youngsters doing it. It’s like that with all types of music. I guess when we were young playing our music it sounded different and weird to the people before us, and before them and on and on and on. You can go back to the twenties when the Charleston and all of that and then up to Elvis Presley shaking his hips. You know, “don’t show that on the TV.” I mean, there’s always progressing and changing and so the scene here changed. Some of the places that were really hip are gone and some of them are still there. A lot of places I remember the building we used to play in and it’s another name and it has been through two or three different entities. But I can just still remember and say: “Man, we used to have fun in here. We made a lot of money. You know, it was alright” and at the time you wouldn’t really thinking about it. It was just “so…?” That’s one way that it affected us; just change of the times. It just happens and then it’s gonna keep on happening. That’s why I like the Blues. No matter what changes it is you gotta still have the Blues. Because you can have happy Blues, sad Blues, a broke Blues, a hip Blues… Any kind of blues, you can say it with the Blues. That’s one of my main reasons. You can express wonderfully through the Blues. I’m not saying you can’t in other music but I find it really clicks with me. Self proclaimed. You know what, I go along with that. I think that almost in every town you go to they claim on it but here in Austin it’s also been so big and supported through the years that there’s no other place quite like Austin. They gotta have Blues through all these years and all the changes and stuff. And not only Blues, whatever kind of music it is: Western Swing, Chicano, it doesn’t matter. Everybody comes down here because there’s that variety and that much talent. If you want to grow you just come down and you will see. Anything that you like you’ll be able to find it here in Austin, no matter what kind of music it is. That’s one reason why I think they self proclaimed capital of the world. People from all over come here and then they really like it. Some people come and then next time they’re gonna move down here. They like it so much. You know, even from overseas or whatever. It’s just a wonderful thing to see it like that, so if you ever come down and get involved with it, you’ll agree with the self proclaimed capital of the music world here in Austin. You know, if you don’t know or care, you don’t. Austin has all kind of things to offer. It just goes on and on and on but the music is been so strong and powerful over that and that’s one of the main draws. Everybody else that’s doing great things: engineers, doctors and science and stuff. [You] don’t really hear that much about them but they’re there. It’s a nice place to be involved in. I remember when I-35 used to be dirt road and now you can see the difference by just driving through I-35 from then until now. It’s growing and growing and growing. But I think we need a lot more support for the musicians in Austin to make it because it’s a hard life. We need all the help that we can get. Most of the time it’s just a lot of people realizing that they’re not helping but it’s much more needed, not only for Blues but all kind of music. Especially helping the kids, and the people that help the kids and it goes on and on. That’s all part of the self-proclaimed capital music of the world, right here in Austin. “My main goal is try to be honest to the music. Play it so the people enjoy it. Tell me about your recordings. The first record I made it was a 45. I made it with the Mustangs. It was entitled “Tender Loving Care” on one side which Sarah Scott wrote the lyrics for me. She was our female vocalist. I arranged the music with the help of Larry Townsend, who was the trombone player, the leader of the group, and my best friend. I can’t even remember… I think we did it in Dallas. We were offered to be on a TV show in San Antonio and in order to be on the show you had to have a record out so we did that record and made that in one day and had it mixed there in Dallas. We were there but then later on I did a Fedora Records album in New York. That was a great opportunity doing that. Then I had a friend of mine, Eddie Stout, who played bass who was like an agent. He has Dialtone Records and I did the Dialtone Records with him, which was really nice. I’ve been playing and doing a lot of more cd’s and stuff like that. Now that I’m retired I can really relax and think about it and have more time to work on the crowd. In what did you work before? I worked about 28 years for the state as a custodian. Doing that I specialized like in floors and all of that but through the years I just about done everything. Working with blind kids and stuff like that shows you how triumphant and brave they are. Little kids, who growing up can’t see, but they don’t want you to help them because they don’t want to be helpless just ‘cause they’re blind. It teaches you a lot about yourself and life itself. That was one of the reasons I couldn’t advance like I wanted to because I’d be too tired to study on my craft. For like seven years I had like four jobs and my first shift would start like at five o’clock in the morning. When I finished playing sometimes it would be like four o’clock, four thirty in the morning before I get home. So it’s a cold shower and back to work. I’m sure I can’t do that now. When I was young I could do all of that stuff. I had to do it to get the money. Talk to me about Bad Habits (Fedora, 1998). Did you go to New York to record it? No, the agent was here in Austin. He was, I guess like yourself, a documenting and recording people. He was going around and then he heard of myself and Hosea too. Hosea did one tour, which was really good. We did it here but he took it and mixed it and did everything up there. He was the one decided on naming it “Bad Habits” because that was just one of the songs on there. When we did all the songs, it worked out really good. 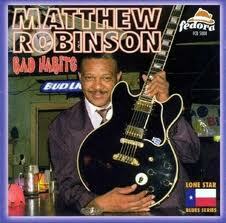 I guess he must have realized: “That Matthew got a lot of bad habits!” [Laughs] But, anyway, that’s how it came about. We did that here in Austin, with Eddie Stout. He’s up there on the picture right there playing bass with the Texas Blues Band. We have a lot of stuff. In fact he’s involved with a lot of these people that you see around here in these walls. They played on his label and stuff too. It’s gonna be really impressive one day. Tell me about your relationship with the Texas Music Museum. Oh, I really like it. We were called a long time ago, I had talked to different people and finally got it up. It was amazing when I came in and I saw all the different artists and things. I can see a time when there’s gonna be no room ‘cause it’s all kind of musicians and stuff here. What’s really special is being born and raised here. A lot of people move from other places and come here and do really good and that’s OK, but when you’re born and raised here, there’s something in itself right there. It does help to be born and raised in Austin, Texas. This is the city that I love. I just wish I could do more. I guess they don’t really care about a little musician or something like that, but anytime I can do anything or help it would be fantastic. I really think the city has a lot of potential. I wish the music families could be in a position to really make a living. You don’t have to make a thousand dollars a minute or nothing like that. Just be able to work as a musician and have a living. You don’t have to have a mansion, or a Mercedes Benz or nothing like that. Just to make it. My main goal is try to be honest to the music, play it so the people enjoy it. If I don’t enjoy it, I can’t play it. It’s a hand-in-hand as far as the response of the people. In the studio I can pretend the microphones and all that are people. But with real audience, you can’t get better magic than that. Unless you record it, you hit the note; it’s in the air, and all the sudden it’s gone. If you don’t record it it’s gone. Talk me about the differences between recording in a studio and performing live. For instance, both of your cd records have horn arrangements. It’s that typical of Texas Blues? Yeah, Texas Blues kind of always has horns and it also spices it up too. I really like to have horns and I would have it on the shows except that I’m not making enough money to be able to pay them to come and play. That’s the drawback to it. On CD’s and records and stuff, you have to scrape up and save money and get them guys in the studio. That’s what helps give it that spice. Recording I try to make it sound like it’s live even though in the studio. Make it feel like it’s live anyway. Sometimes I make a little mistake or something. Just leave it in there. [It] might not be as bad as you think. That’s all part of making it sound more live; the spirit of it all when you’re listening to it. It’s a special art to be able to play live and then go in the studio and make it sound like it’s live. Of course, you have advantage in the studio. You might stop and do something over or double something. But mostly if you just want a 1, 2 or maybe 3 takes… It’s all it takes. That’s the way I like it to do. Don’t mess it too bad. Do you have any particular favorite artist or record? I can’t really pin point one thing because I really get involved in everything I do. Every type of music I really liked it. 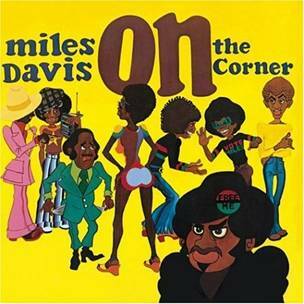 I guess my favorite record of all times is Miles Davis’ “On the Corner” (Columbia, 1972). There’s just something about it and the players that’s on that, that I really like it. The way he’d be playing on the outside edge of everything, I like that. I wish I could express myself like that. Who know, one day it might pop, I don’t know. As far of my favorite one, I guess that would be it: Miles Davis - “On the Corner”. Have you ever heard of that? Even though he got others and other people got others… I think I bought it six times, I’d listen to it so much I had to go and buy it again. It has this yellow cover with Black people in the street. It starts with “On the Corner” and if you look at the name of each song it’s saying what the story is. It tells you about the whole thing right there and you could see it on the cover. You might wanna listen to it and say: “Matthew, why does he like it?” [Laughs] Next time just listen to it and maybe it will give a little insight on how my voicing and my playing. When I hear a certain sound, it’s just something you can build up from. I don’t wanna do all of it, just hang on one thing. It might not be the major sound of that chord. Maybe I develop the way I can really express myself right one of these days. That’s what I’m working on. But you’ve been doing it for many years. [Laughs] I tell you what, I guess you’re your own self worst critic. I would never be satisfied until I go to the next level, and there’s always a level to go to. When you get to the top, when there’s nothing else to go, that’s when it’s time to stop. I don’t see myself ever wanting to stop so I have to keep setting it a little bit higher, a little bit higher, a little bit higher. Of course, I can never reach that and I can’t play what I’m thinking because I’m too slow for what I’m thinking. By the time I realize it, it’s gone. You just keep working and now I’m hoping and pray that I can get a little closer to there. What makes Texas Blues different to the other styles of Blues? I went to school with some Spanish guys and when they talk it’s like [imitates the sound] and when they’re playing, that’s the way they play. But it’s hard for them to slur. We talk slurring so it’s easy for us to slur but it’s hard for us to do stuff like that because it’s not the way we talk. So it’s in the environment that you’re brought up in and then, from that extension, whatever exposure you had. Often times, a lot of people I liked had that kind of flavor. Albert Collins, Freddie King, BB King, T-Bone Walker… all these guys. Barney Kessel, Charlie Bird… I mean it’s endless. It can go on and on and on. To me, that’s what made my particular Texas sound. I think other people can recognize the Texas sound more than people that’s really Texans because we’re doing it all the time. We don’t know the difference to that extent as someone else. They’ll say: “Oh, they’re from Texas!” If we talk, you can understand ‘cause you can hear the way you talk and you can’t deny that. When you play it’s the same thing. That’s the only way I can explain. It’s your environment ‘cause if I wasn’t born in Texas and born somewhere else, it‘ll be different. It’s a puzzle to me really. How would you explain your own style? Would you say it’s Blues, Rhythm and Blues…? I just kind of mix everything together: from Gospel to Chicano music to Jazz. I like the quartet-singing type of church music. That’s had a big influence even though I was in the choir when we were going to church and there’s a difference there. There’s such a wide variety of what makes my style, I just had never thought about it deeply. But it’s gotta be all of those different influences that come together. It’s something about here in Austin, watching all these famous people. I’m sure people have that everywhere but right here in Austin we seem to have our share really full played of it. Not only music. Football players, basketballs, baseball, racecar drivers, dancers, ballet people… symphony orchestra… Everybody in every town have those things but to me it’s always been real special. What is the relationship between Blues and Jazz, and Soul...? Well, that feeling you can draw from it. I think that’s why your goal to Soul and Jazz is because you want to express differently and having the Blues root there gives you a starting point. It’s endless as far as you can go but I think it has to steam from there because everybody that has ever really done anything started out somewhere like the Blues. You know, talking about country and western, and western swing, and hillbilly music and stuff like that… they had their own cultures. It’s just the same thing. Those are really the same; it’s just the flavor that they’re putting on there. I think everybody has their own. You can start out with Blues and venture to whatever kind of goal you like. One of my favorite was Miles Davis. I loved his music, the way he played. Playing in one key, playing in another one… I do that all the time [laughs] not playing the horn. But it started right there with the Blues, for me and everybody that I know. I met one guy and said: “everybody in Austin know how to play the Blues, man!” I was: “Wow, that’s what they think” so I’m not gonna argue with him. In your guitar style, it sounds like you spiced it up with jazzy stuff. Yeah, ‘cause playing and having the influence with James Polk… He’s such a monster on keyboards and it’s just in me. When I try and do something it just comes out, I’m not really planning on doing it. I don’t think it’s such a bad thing but maybe I should probably try to do more Blues. But when it comes out that’s the way it comes out. I can’t really help that. So that influences the way I have to do my structures and my chord voicing and progressions and all of that. That’s what has made my sound the way it is. Everybody probably does that. How was your experience playing in Brazil with Nuno Mindelis in front of twenty thousand people? That was fantastic! It was one of the great experiences I’ve had in my life. That was so fantastic. [Nuno Mindelis] had total faith in the project and it came off really good when a lot of people thought it wouldn’t come off, and it did. I mean it was spectacular. I really felt really special. You couldn’t believe it. On the bottom of the stage they had people skating in the line and they were showing that on TV while we were giging. People everywhere, it was really something to be part of and everybody on that tour just had a great time. For me, I was grinning from the ear to the ear, even in my sleep [laughs]. I loved it. It was something else. It came out through Eddie Stout and Nuno. [Nuno] recorded here too, some stuff in Austin, and [Eddie Stout] was the agent who got us involved in that. It was a really good thing for us. A lot of opportunities came from there. It was a very special deal there; I would love to go back. Do you have any favorite memory? Just playing there with them and all those things that we did. I got a few pictures and stuff and it was just fantastic. You couldn’t believe a lot of the people. When I moved I had a lot of stuff that I haven’t unpacked yet so I can’t get back to all. Some of the films I still haven’t developed yet. So, with a little bit more time I’d be able to go through all of that and see what happens. I really loved that, playing there in Brazil. That was one of the magic times. I can’t believe it, it was just wonderful. One time we went out and over there they do everything with the cab, it’s unbelievable. But this is the first time I had to experience when we went there. We went in because we wanted to eat some fish and they had fish all over from here to there, all kinds of fish. So when I was saying: “Oh I’m so full” a guy came in and said: “Ok, we’re ready for the main course” and I went: “What? Main course?” So then this guy started coming out. Each chef had a different specialty and they just walked round the tables. You could still hear it sizzling from being just freshed cooked. They passed by and I said: “What’s that?” He said: “That’s this part of the …” I said: “Well, gimme some of that”, and they won’t stop. You know, they will not stop. Then it was desert time. I went “Oh my god!” I was so full when they came to me and said gotta be something. I said: “Gimme one cherry”. And they did, fresh plate, fresh cherry. That’s how full I was. We felt so good. That was amazing for me. And now I think they have a few places in Austin that’s like that but I haven’t gone to any yet. I’m trying to find out where it is. But I would love to go back, do that and make me feel I am right back in Sao Pablo. Is music appreciated differently overseas? Well, my experience is that it’s a difference because just being in a totally different environment. The appreciation overseas to Bluesness is so incredible until it makes you come out of your shell or yourself - being whatever you really wanna think of that you get inspiration from - and they really enjoy. It makes you feel special and you would do something that you normally wouldn’t do because you just feel like you’re free of every tie, and everything. You would play differently and after that experience, when you come back, it’ll teach you to play differently. It just keeps evolving like that. As many times as you can go, go and come back, and keep doing it. During the Sixties the bands of the so-called British Invasion basically came from the Blues but they were selling a lot more. Well, ‘cause they were playing it the way they felt it, and it was more popular because they felt it in a different type of way. Because of it, it kind of pulled Blues with it. But we have to remember [that] before the Blues they were doing Gospel and before that it was like field hollers and stuff like that. Before that, Africans didn’t have that because when they were brought over as slaves they weren’t allowed to speak their language. But they could beat drums and communicate like that. So it goes way back go get it to the point. That’s why all the rhythm seems so syncopated and everything. Something that might be easy for me to do might be hard for someone else to do and it’s just because environmental culture gave edge to that. You have to be really thinking of all that stuff. It’s just the way you see your thing you brought up. It’s a funny world. You keep thinking of the Bluesman as a storyteller. It’s not a rock band, it’s about the Bluesman and the stories. Exactly, because you’re writing about life events, moments or something that you’ve seen or you felt. You’re telling about that. It always makes a nice story if you can pull it together and explain a situation in your life and the people get it. It’s just a wonderful thing. It’s really hard to do but it’s very easy to do. It just depends on you; your imagination is where it’s really at. If you can think of how to communicate that to the people, that’s the trick right there. To me it’s all one thing. If you tell me to sit down and write a song about the ice-cream cone, to me there’s the chords already, the melody, and the title, the ice-cream cone. Some people write the words first, some people do the chords, some people do the melody first… I think the best way is when it all comes out in one. I work better with someone else. They’re doing something, and I’m saying something. We’ll work together and the ideas will pop. Otherwise, I’ll be thinking so fast that I’ll forget the main idea. And it’s gone! 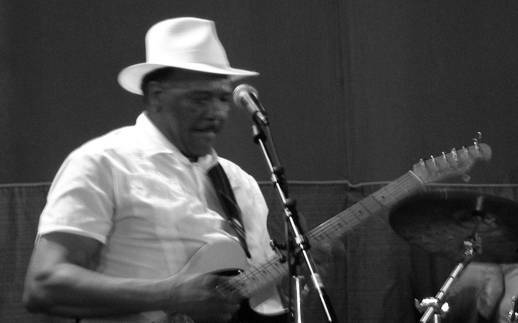 Do Bluesmen, like wine, get better as they get older? I’m sure because you learn more and you learn to settle down. Because of your age you can’t turn a flip on stage anymore but you can express it in other ways and I’m sure that it does get you better. That’s like everything. If you keep doing it and keep doing it for years and years, you gonna be really good at it one day. So I got a long way to go, yeah. But I got will, I’ll get there. 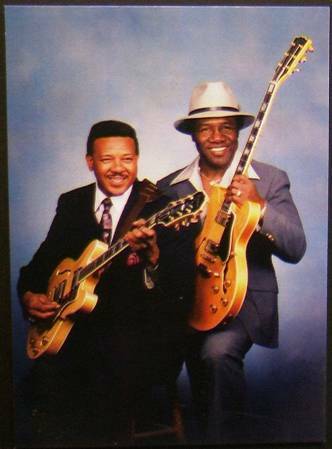 What do you think about the Peterson Brothers, playing Blues at such a young age? I thought those guys is fantastic. To be playing on that level at a young age. I know some guys that’s playing for a long time and can’t play good like that. The ability and how they’re coming up… It’s a great future because they’re gonna make sure that someone is gonna hear the Blues. You never know when the next person comes out - maybe hasn’t been born yet - that’s gonna be next storyteller, spokesman, superstar… whatever you wanna call it. We admire them so much. As long as young people are interested in it and trying to do it, that’s a great thing for not only Blues but music, period. Those guys are really special. They got a little different bond ‘cause they’re brothers so they can probably communicate not only through music but by just looking, an expression, whatever. They got a long time to get it. It’s kind of scary to think in a couple of years from now what they’re gonna sound like. I love those guys. Tell me about the different guitars you’ve had. I’ve had all kind of guitars but I had a friend that made me a guitar. Looks like a Tele[caster] body with a Gibson neck on it. Its name is John Hendricks, he’s from Boston. I met him down here playing in some of the clubs and he made the guitar for me. I still have it. In fact, that was the one I had when I played with Nuno. They got pictures of us playing at stage together with that [guitar]. Anyway, I’ve had at least seven or eight different Les Pauls, all kind of Strats, SG’s, big jazz guitars… So many guitars over the years and I don’t really know what I was looking for. I always wanted a Tele but for some kind of reason or another I never got one. Finally, I got one and it just happened to be the sound that I heard in my head, it was what I like. I said: “Man, if I had just got this, I would have saved all that time, and money, and energy.” I love that sound, the feel of it, and the way it plays. I like all of them but that one does everything that all of them did so I have to stick with it. I like the Stratocaster a lot but the targo switches in my way and it just don’t work that good. I have a good idea coming and accidentally hit that targo, switch it, change the tone and stop what I’m doing. And everything just lost. I said: “I might have a heart attack here on stage if I gotta keep playing on the Strat!” I love them, but it’s not for me. I just got ideas that I wanna do for my next CD. Right now I’m just trying to picture it in my mind completely and totally before I get it and start showing to everybody. I really wanna have it right down to the exact thing. Once I get that, I’ll start writing it. Then, from that, I’ll show other people and other ideas coming in can make it blossom. Keeping it simple right now, the simplest possible it can be so it can breath and grow. With the help of everybody else when I do that, I think I might came up with something nice. That’s what I’m doing and hopefully it won’t take too long. We’ll see what happens. I’ve been working on it a year now. I’m getting pretty close to getting to it. Is there anything I didn’t mention you’d like to say? No… I’d like to thank you for coming down and filming the show the other night at the Blue Moon, and thanks for having me on the interview. Just tell all the people that I just love them and I wanna keep on doing it. If they enjoy what I do, thank you. And if you don’t, I’ll work harder to pull you in.